AS part of my other writing life there are times when a press release drops into ye olde inbox that makes you halt the wee typing fingers and pause. One such release announced the release of 'Joe and Seph's' Marmite Popcorn. Marmite famously trades on the schtick that you either love it or hate it (which makes all sane people wonder about the wisdom of marmite popcorn...). Similarly there used to be amongst the metal community those that either loved Devildriver or hated Devildriver. But now, seven albums later Devildriver have not only won over most of the metal community, but have delivered a consummate distillation of all the strong points from the previous releases. 'Pray for Villains', 'Beast' and 'Winter Kills' all had a unique take on the DD sound, but now Dez Fafara and his cohorts have harnessed those albums and the earlier released to produce what is probably their most mature album, without losing the sheer heaviness of the Californian crew. 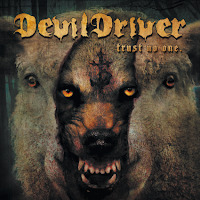 What really distinguishes this release is that Devildriver have allowed some of the tracks breath, with Mark Lewis's production doing so without losing the intensity of the songs. Examples are such as 'This Deception' and 'Above It All', but above all the so-called groove metal albums are still in place. 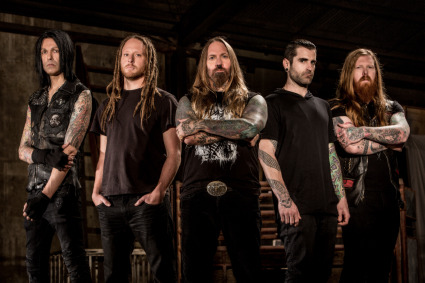 The clichéd term of groove metal has always slightly belied the other elements of Devildriver's sound. The speedy title track has as much thrash in its elements as groove. Throughout guitarists Mike Sprietzer and Neal Tiemann tear it up - some of the riffs and licks are amongst the best they have ever delivered, while Austin D'Amond's drums provide power and punctuation. What the music and lyrics provide are a combination of corrosive chaos that provides a cathartic release, tracks to pummel the wall with your fists and yell into the abyss. Trust No One? Perhaps, but you can trust Devildriver. Now, where is that Marmite Popcorn to accompany the beer?